Designing a living room can pose some challenges, but designing a north-facing living room can be tricky... However, it can also be a blessing in disguise – no sunlight streaming through the blinds as you try and watch TV? Sounds ideal. But if you need a bit of help making the most of your space, here are some tips and tricks for transforming a dimly lit living room into a cosy, relaxing haven. It goes without saying that using light colours in a north-facing room can make it look brighter. White walls are major light reflectors so will enhance any natural or artificial light. Try using colours like Annie Sloan’s Old White or Dulux’s Jasmine White for that light, airy feel. Even warm grey-toned neutrals would have a similar effect or if you want a little colour opt for pale dusky pastels. Check out our white living room design ideas to get some inspiration. You could always of course embrace the darkness and accentuate it with deep, dramatic paint colours. Strong colours like Studio Green from Farrow and Ball create intimacy in a room, making the lack of natural light seem cozy and inviting rather than dim and dingy. If you want some more inspiring ideas check out our grey living room design ideas and our dark and atmospheric decorating ideas. Whether you choose to go dark or keep things light, always choose warm tones as the light coming in to a north-facing living room will usually be cool. Of course a lighter coloured carpet is going to reflect the most light, as well as pale hard-wood flooring. We are loving Scandi inspired white floorboards at the moment and they would work perfectly in a north facing living room. But, if white flooring is just too high maintenance for you, a white washed or pale hardwood floor is another option. And, fear not, if you are doing your living room on a budget there are lots of realistic wood-effect vinyl flooring options out there. Where you can, avoid heavy, bulky furniture, instead opt for slimline, low slung pieces, that will allow for as much light as possible to flow around the room. Steer clear from anything too dark and instead choose furniture that is going to reflect light around the room; think marbled sideboards, pale wooden TV stands and mirrored or glass coffee tables. Find out how to choose the best living room furniture and how to pick furniture for a small living room. When choosing how to lay out furniture in a north facing living room, look first at where the most natural light falls. Then think about how and when you use each piece of furniture. A sofa that you only use to slob out on in the evenings is in less need of natural daylight than a reading chair or a home office area, so make sure to place these light dependent items near a window. Avoid putting any heavy, dark furniture near windows as this is obviously going to block out light. Reflective furniture can have a similar effect to a mirror and will bounce light back into the room so place any items that have a light or metallic surfaces in the areas that get the most natural light. Wallpaper is your friend when it comes to enhancing light in a north-facing room. Choose a living room wallpaper that has a metallic finish and a pale background colour to maximise how much light it will reflect. 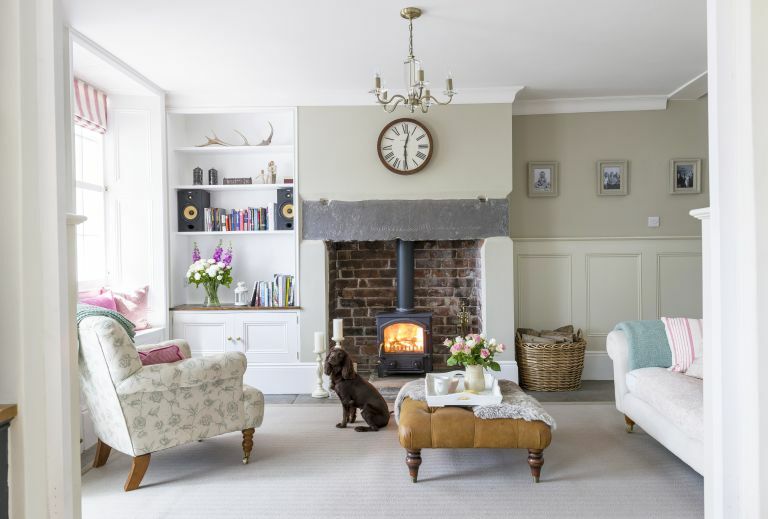 We love the subtle print of Farrow and Ball’s Hegemony and it would perfectly suit both a traditional living room and a more contemporary living space. For a well-lit north facing living room, you will need to incorporate three different types of lighting: ambient, accent and task. For general ambient lighting in a dim room you will want to create an even layer of overhead lighting. If you are working with a central pendant light just be sure to choose a warm shade or bulb that gives off a welcoming light. Ideally your overhead lights should be dimmable so they can be adjusted at different times of the day. Once you have overhead lighting covered you want to think about more specific lighting – accent lighting, and task lighting. Adding different layers of accent lighting is what creates ambience in living room so we recommend having at least three different sources. Evenly space tables lamps, wall lights and floor lamps throughout the room, mainly sticking to the edges as this will create a warm, even glow that bounces inwards. If you have an office desk in your living room, first make sure it’s positioned in the space that gets the most natural light and then add a task light – an anglepoise is our personal favourite. Light bulbs can also make an impact. Choose warm bulbs to counteract the harsh light or daylight light bulbs which are designed to replicate natural light. Find out how to plan living room lighting, and don't miss our living room lighting ideas for more. We all know this one, using mirrors to create the illusion of more space and light is the oldest design trick in the book. Placing a mirror on the adjacent wall to your biggest window will reflect the most light, and obviously the larger the mirror the better, so go as big as your living room can handle. If you are working with a small north-facing living room, choose a mirror with a thin frame, it can still be generous in size but won't overwhelm the space. We've got loads more design ideas for displaying mirrors, plus tips for designing a small living room over in our guides. Window blinds: vertical, Roman and Venetian all work well in a north-facing living room as long as you choose a light or sheer fabric and ensure they can completely retract so as not to deter natural light. Fussy, heavy living room curtains will always partially block out natural light so opt for curtains made from a light, sheer fabric, and make sure your curtains are hung so that they can be pulled right back against the wall and don’t obstruct the window when open. Looking for more living room window ideas? Check out our inspiring gallery. A clean aesthetic is always going to make a room feel lighter and brighter so, we hate to say it, but that means organising all the stuff that has accumulated in your living room. Invest in some living room storage that fits with your space, and get all that light sucking clutter hidden away. Filling up your window sills with knick knacks, house plants and neglected half-read books? It may look lovely but a cluttered window sill is going to prohibit light, so keep them clear to allow as much light to flow in as possible. If there are certain items that you just love having on show, opt for keeping them in open storage instead. Got house plants? Keep large, dark plants clear of windows and instead group them around the edges of the room. Yep, even the smallest things in your north- facing living room can have an impact. When picking accessories for your space, choose pieces that will reflect light around the room. Metallic vases, mirrored picture frames, marble candle holders, copper plant pots, you get the idea.